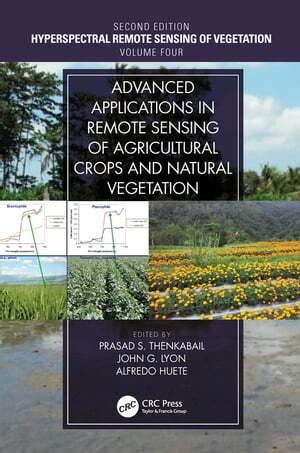 Collins Booksellers - Advanced Applications in Remote Sensing of Agricultural Crops and Natural Vegetation by Prasad S. Thenkabail, John G. Lyon & Alfredo Huete, 9780429775154. Buy this book online. Written by leading global experts, including pioneers in the field, the four-volume set on Hyperspectral Remote Sensing of Vegetation, Second Edition, reviews existing state-of-the-art knowledge, highlights advances made in different areas, and provides guidance for the appropriate use of hyperspectral data in the study and management of agricultural crops and natural vegetation. Volume IV, Advanced Applications in Remote Sensing of Agricultural Crops and Natural Vegetation discusses the use of hyperspectral or imaging spectroscopy data in numerous specific and advanced applications, such as forest management, precision farming, managing invasive species, and local to global land cover change detection. It emphasizes the importance of hyperspectral remote sensing tools for studying vegetation processes and functions as well as the appropriate use of hyperspectral data for vegetation management practices. The concluding chapter provides readers with useful guidance on the highlights and essence of Volume IV through the editors’ perspective. Guides readers to harness the capabilities of the most recent advances in applying hyperspectral remote sensing technology to the study of terrestrial vegetation. Includes specific applications on agriculture, crop management practices, study of crop stress and diseases, crop characteristics based on inputs (e.g., nitrogen, irrigation), study of vegetation impacted by heavy metals, gross and net primary productivity studies, light use efficiency studies, crop water use and actual evapotranspiration studies, phenology monitoring, land use and land cover studies, global change studies, plant species detection, wetland and forest characterization and mapping, crop productivity and crop water productivity mapping, and modeling.